Hiring Technicians: Do You Have What It Takes? 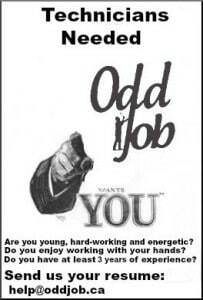 Odd Job has been serving the City of Toronto since 2008. From the beginning, we’ve been developing a reputation as the city’s best handyman service – for clients and employees alike! As the celebrated “season of home improvement” is coming closer and closer, we are hiring technicians. Aren’t you tired of putting up posters and hoping for enough calls to make ends meet? Or working for a company where you’re little more than a number and the upper management is barely aware of your existence? Odd Job is not simply a company – it’s a team. While we’re bettering homes and businesses every day, we’re also working to better each other. Would you like to meet and work alongside awesome people who are good at what you’re good at and can help you get better? Would you like to be a valued part of a family instead of one more gear in a massive, borg-like machine? Receive training in the areas of work we perform. Work alongside the company’s leadership, to whom your opinion will matter. Meet and help people around Toronto every week – beats putting posters up on telephone polls! Be provided access to power tools and construction materials for all standard projects. Travel from project to project in a sweet-looking mobile workshop with everything you need! All applicants must have have their own tools, must live in Toronto, and must have a valid drivers license (G). What is a Senior Home Technician? Don’t worry – you don’t need to have eight arms like Dwight! 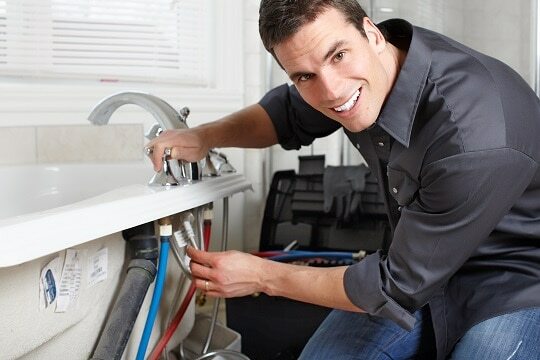 Our senior home technicians form the core of Odd Job Handyman Services. With extensive skill and experience in all of the services we offer, they are our first line of defence. If we were an army, they’d be the generals. If we were a law firm, they’d be the senior partners. Since we aren’t any of those things, the role of the senior technician within the company is a cross between the baseball team’s most valuable player and its head coach. They should have at least 10 years of experience and they should be very good at what they do. We are looking for candidates with a strong work ethic, a positive attitude, and who are highly skilled in organization, interpersonal communications and time management. We want to see a high attention to detail, and an exceptionally high level of accuracy. The position is physically demanding, and involves bending, crouching and kneeling. You will be required to lift heavy loads up to 35 lbs., sometimes moving heavy furniture, equipment or supplies. Perform a wide variety of handyman tasks, including (but not limited to): drywall, flooring, tiling, hanging, interior and exterior painting, furniture assembly, shelving installation, basic plumbing and basic electrical. Coordinate multiple small projects in a single day and take a leading role in larger projects, supervising one to several junior technicians. Maintain professionalism and friendliness in all communications with clients – after all, they’re your neighbours who you haven’t met yet. What is a Junior Home Technician? Our junior home technicians assist the team by playing a vital support role to senior technicians in virtually all of the capacities listed above. They should have at least 3-4 years of experience and should be skilled in the use of all hand power tools and workshop tools. A good candidate will have a strong work ethic, a positive attitude, a high level of accuracy and great attention to detail. They will be excellent at taking instruction, and will have excellent interpersonal skills that should be used both in communications with clients and with other technicians on site. 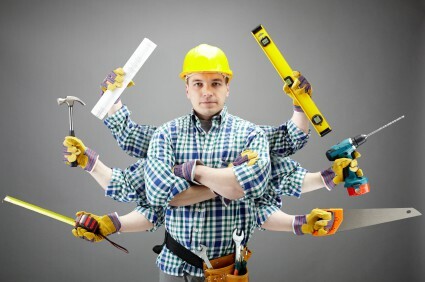 Assist with a wide variety of handyman tasks, including (but not limited to) tiling, carpentry, drywall, interior and exterior painting, basic plumbing, and basic electrical. Work efficiently with minimum supervision, both independently and as part of a team. Participate in a multiple small projects around the city in one day, or participate in a larger project. Maintain contact with the office and keep them informed as to any issues and as to what you and the team on site needs. Be able to use all workshop tools and power tools. Odd Job is known for many things – for quality, consistency, and complete honesty and transparency with our valued clientele. 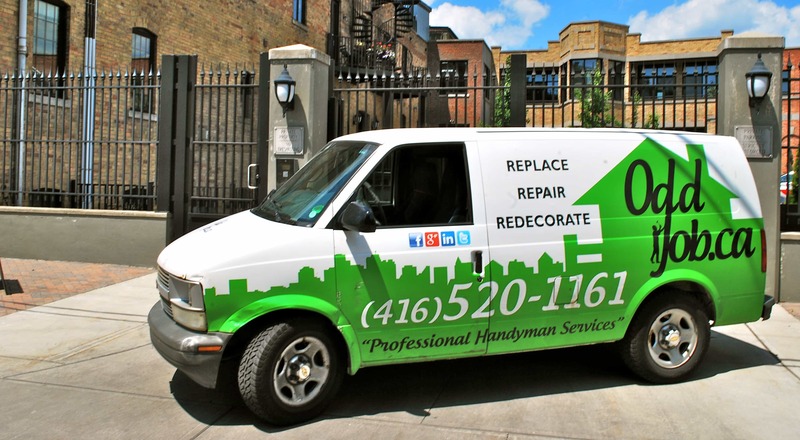 We are increasingly becoming known as Toronto’s premier handyman service, with scores of ten-star reviews. We are also becoming known unofficially in local professional circles as “the handyman service that won’t stop growing.” We tripled in size last year, and we’re hiring technicians now because we know there is awesome talent out there that we have not discovered yet. This entry was posted in Blog and tagged hiring assistant technicians, hiring technicians. Bookmark the permalink.